The multi-level laminating mixer (MLLM) is a static mixer whose concept is based on a three-dimensional implementation of the baker’s transformation. The present work is a first attempt to study the MLLM from the viewpoint of heat transfer efficiency. Both numerical and experimental investigations using water as inner (hot) fluid are presented. One of the key results is that the Nusselt number averaged over each basic element forming the MLLM remains approximately constant whatever the element location, a behavior we relate to the cutting/stacking mechanism. 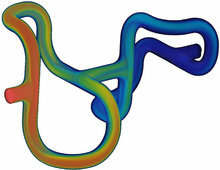 Now, for the studied range of Reynolds numbers (10–3000), the flow is no longer restricted to the baker’s transformation and the analysis reveals the presence of Dean vortices in the succession of elbows. These vortices have a strong influence on heat transfer, in accordance with many works of the literature : the Nusselt number of each element asymptotically increases as the square root of the Reynolds number for sufficiently high Péclet numbers.